Reb Russell seated on his horse Rebel. Born Lafayette H. Russell in Coffeyville, Kansas in 1905, Reb got his nickname while playing football at the University of Nebraska and Northwestern University. Russell excelled at the sport, gaining All American status in 1930 and playing briefly with the New York Giants and the Philadelphia Eagles. However, he chose instead to pursue a movie career after he got a bit part in Universal Pictures' The All-American (1932). 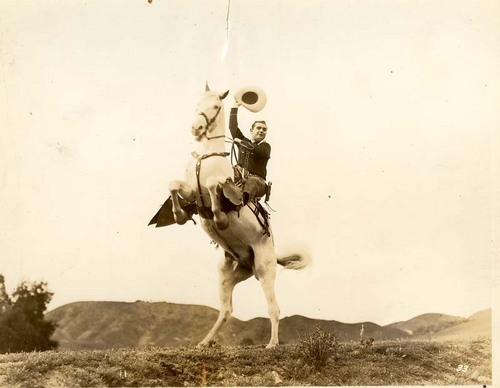 Because he was an excellent rider, Russell became an actor in western movies. He appeared in a number of low-budget independent westerns, including The Man from Hell (1934), Fighting Through (1934), Outlaw Rule (1935), and Lightning Triggers (1935).